What will happen to Dorothy Day’s former church? 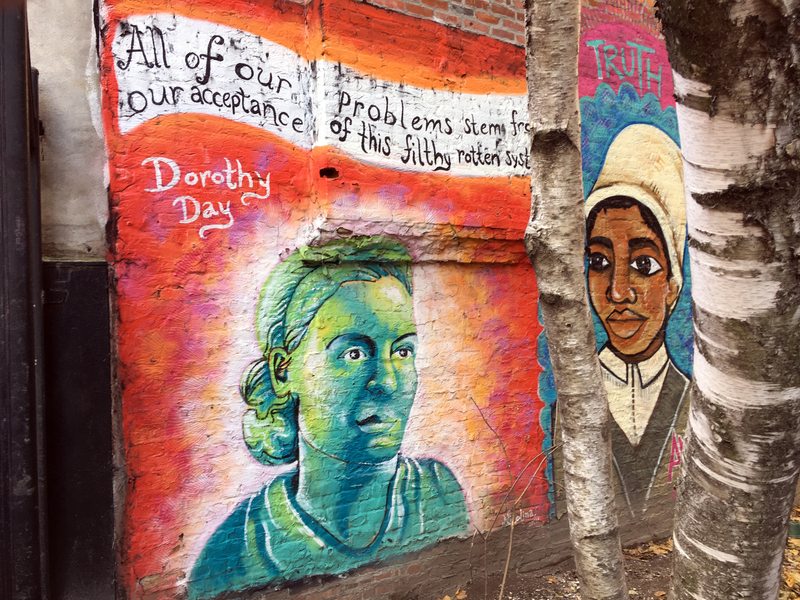 Dorothy Day’s parish, the Church of the Nativity, served the Lower East Side neighborhood of Manhattan for nearly 50 years before its deconsecration by the Archdiocese of New York in 2016. (It had merged with Most Holy Redeemer Church in 2015.) Whether the site will be developed into luxury apartments or low-income housing remains the subject of contentious debate. On Nov. 29, Rebecca Amato, a professor at New York University and associate director of NYU’s Urban Democracy Lab, presented on the Church of the Nativity at the Pontifical Council for Culture’s international conference on cultural heritage in Rome. The topic of the conference, “Doesn’t God Dwell Here Anymore?,” facilitated discussion about reusing church landholdings after they are decommissioned. In the case of the Church of the Nativity, the parish of Most Holy Redeemer stands to net $50 million from a luxury housing deal. Meanwhile, former parishioners have proposed to purchase the decommissioned church for $18 million to develop low-income, senior and homeless family housing. In an interview with America, Ms. Amato talked about gentrification, inequality and the importance of space and place to understandings of class. The trend to develop sites into luxury housing emerged within the wider economic context of New York City in the roaring 1990s. Her presentation notes that the Archdiocese of New York “has sold at least nineteen sacred properties for luxury development since 1996.” While Ms. Amato did not claim to provide a definitive account of the archdiocese’s institutional objectives, financial planning and personnel shifts, she said that the trend emerged within the wider economic context of New York City in the roaring 1990s. “At that time, municipal government began to align itself more fully with a neoliberal growth model under Mayor Rudolph Giuliani,” she told America. Public spending decreased, and the government “moved instead toward incentivizing private interests to take charge of financing and controlling these public goods,” including schools, homeless shelters and parks. After Michael Bloomberg became mayor in 2002, this process accelerated. In the public imagination, New York became a luxury city, the stomping ground for a highly educated, high-earning workforce. “The archdiocese has been behaving toward its property like any smart capitalist enterprise would at a time when municipal government was very much realigned toward increasing the investment value of the entire city and rebranding it as a high-end commodity,” said Ms. Amato. Members of the Catholic Worker, which Ms. Day, an advocate for the poor, founded in the East Village in the 1930s, are disheartened by the trend but hopeful that Nativity will be developed into low-income housing. “Church closings are made more painful when the property sales are so injurious to the community,” said Joanne Kennedy, who has been a part of the Catholic Worker Movement since 1991. “We have been making a concerted effort to offer good alternatives for the Nativity site for a little more than a year. But we have been lamenting this destruction of communities in many neighborhoods for decades. “The unnatural inflation of property values in Manhattan is the near occasion of sin. It is hard to resist, no doubt,” Ms. Kennedy said. According to Ms. Amato, the gentrification of the Lower East Side has its roots in the 1970s, when the city’s fiscal crisis loomed large. City Planning Commissioner Roger Starr subscribed to a process he termed “planned shrinkage.” If the city shut off welfare and social services to low-income neighborhoods, he postulated, the poor would eventually leave. Private landlords stopped maintaining their buildings, too. “Churches like Nativity and Mary Help of Christians were anchors of the community when it seemed everyone else had abandoned it,” said Ms. Amato. By the 1980s, the Lower East Side, with its bevy of abandoned buildings and undervalued land located near the booming financial district, had become the ideal target for developers. Gentrification continued into the 1990s under Mr. Giuliani, then expanded in the 2000s and 2010s. Gentrification continued into the 1990s under Mr. Giuliani, then expanded in the 2000s and 2010s. Reached for comment, Joseph Zwilling, the spokesman for the Archdiocese of New York, said that Most Holy Redeemer-Nativity is in charge of the sale. A number of proposals are currently under consideration, including one for “affordable housing.” Mr. Zwilling did not specify who exactly would make the decision. Mr. Zwilling also said that the parish, which will receive the money from any sale, may be expected to pay back outstanding debts to the archdiocese (which has given “archdiocesan subsidies” to the parish in the past). Ms. Amato believes that the decision cannot and should not disregard the history and identity of the community. “Place is belonging,” she said. The Catholic Worker has been proposing alternative uses for the property, including low-income and senior housing. Founded in 1842, the Church of the Nativity served the area’s growing immigrant population. Ms. Day’s funeral was held in the Church of the Nativity in 1980 and her sainthood cause has been championed by Cardinal Timothy Dolan. For decades the parish was administered by the Jesuits. The goal of the international conference in Rome last month was to help dioceses work with their local communities in finding appropriate uses for decommissioned churches. In a message to conference participants, Pope Francis highlighted the importance not only of protecting the sacredness of decommissioned churches, but also of ensuring that their subsequent use will continue to serve those in need. Reporting from Catholic News Service was included in this story. This story has been updated. What is the "parish" to which Joseph Zwilling refers? I bet he is referring to the parish corporation, the secular entity that exists alongside the canonical one. Per NY State Religious Corporation Law, the 5 member corporate board of the parish consists of the diocesan ordinary (here Cardinal Dolan), the Vicar General, the parish pastor and 2 lay trustees appointed by the pastor. Although the parishes are distinct corporate entities, the archdiocese has near total control of the corporate board and their decisions owing to its composition,appointment process and other administrative processes (e.g., pastoral shuffle). If someone can can cite an instance where the pastors and lay trustees voted against the Cardinal and Vicar General, I will throw my hands in the air in praise of the Holy Spirit. This article also appeared in print, under the headline "What will happen to Dorothy Day’s former church?," in the January 7, 2019 issue.